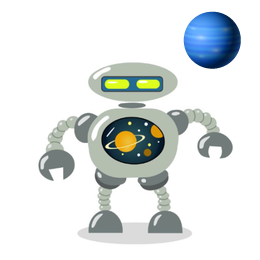 The planet Mercury is the closest to the Sun and is also the smallest of the planets, and is named after the Roman God. Who was the Roman god of trade, thieves, and travel, as well as the Greek god Hermes, the messenger of the Gods, who is sometimes depicted wearing winged sandals. Mercury orbits the Sun roughly once every 87.970 Earth days, and rotates once every 58.647 Earth days. The Suns rays are approximately seven times stronger on Mercury than they are on Earth. 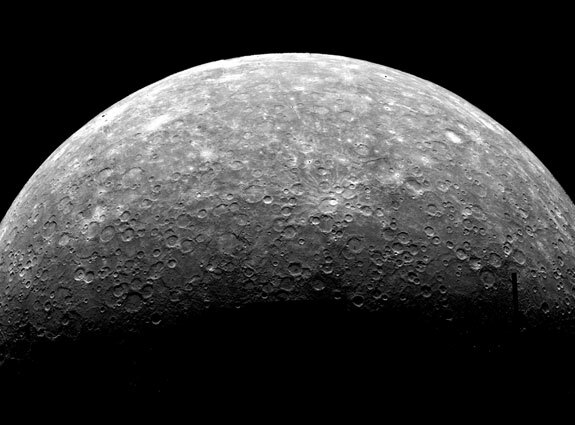 During the exploration of our Solar System, Mercury has been visited by two space probes Mariner 10 and Messenger. Mercury is one of four terrestrial planets in the Solar System, the others being Venus, Earth and Mars. The rocky mass of Mercury is comprised of 70% metallic and 30% silicate material, and its density is the second highest in our Solar System, and its core has a highest iron content out of all the eight planets in our Solar System. The planets surface exhibits heavy cratering and large dark basaltic plains, that are similar to that of Earth’s Moon, and the temperature on its surface can vary between 450 ?C in the day dropping to -170 ?C in the night, and on the dark side of planet shaded from the Suns heat. Mercury’s atmosphere is very thin and the planet is too small in size for gravity to retain any the atmosphere over longer periods of time, which escapes into space. Due to this is it very unlikely that Mercury has any for of life living on it.